I suppose once could say it's electric like our pressing game . "I wouldn't say I'm the best manager in the business, but I'm in the top one." Its got to be a wind up that KK. Please tell me it is. 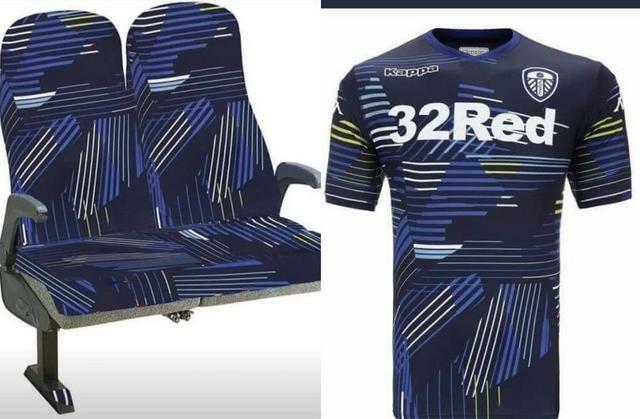 I mean why oh why would the Football club choose a design that's on bus seats? When you let a bored kid loose on a computer this is what you get! I actually like it, I take it this is what we'll be wearing tonight against Derby? DominanceUK wrote: I actually like it, I take it this is what we'll be wearing tonight against Derby? I'm all for flamboyancy and trying new things and looking at this new away kit isn't any of them. It's another bad move from the powers that be for allowing Kappa to design this disaster. Seriously who is the person who makes the final decision on these things to do with the badge or kit designs? If it is Radz then I'm sorry but his glasses must need checking for over zealous astigmatism or an inflamed retina. Is it all the money sign's he is seeing when he looks at things or has no concept of tradition. I like the color but those damn stripes are downright rude and awful. CorkWhite wrote: I'm all for flamboyancy and trying new things and looking at this new away kit isn't any of them. It's another bad move from the powers that be for allowing Kappa to design this disaster. Seriously who is the person who makes the final decision on these things to do with the badge or kit designs? If it is Radz then I'm sorry but his glasses must need checking for over zealous astigmatism or an inflamed retina. Is it all the money sign's he is seeing when he looks at things or has no concept of tradition. I'll run with it if it means scoring 4 away from home !! That's a fair point Davy, I'm with you on that. I don't suppose if anyone who's been to the club shop knows what the stock is like? I was planning on getting the home shirt when I travel up Saturday. I'm a size large and they're sold out online - was wondering if that's the same case at the ground.